Phrygian dominant has a distinctively "exotic" sound that can be used in many styles of music. Its roots are in musical traditions such as flamenco and Middle Eastern music, but modern styles such as rock and metal have made use of the scale for its hauntingly tense quality. In this lesson, I encourage you to explore the scale, applying it in different musical situations. I've also provided backing tracks and examples to aid you in this exploration. By the end of the lesson, you should be confident with using the scale both in your own music and to accompany existing music. Like all scales, phrygian dominant has its own sequence of intervals that create its unique sound. As you can see, like the major scale, phrygian dominant contains the intervals of a major triad (1, 3, 5), which tells us its root/tonic chord is major and therefore the scale will work over major chords (although not every instance). 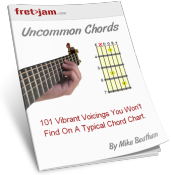 Use the pattern above to explore the scale over the chord tracks below. They're "drone" tracks, which means the chord plays out without any changes or interruptions. You can set your own metronome beat to the tracks if you wish. Harmonic minor and phrygian dominant are intrinsically related, because they in fact share the same notes. Phrygian dominant is the 5th mode of harmonic minor, which means it begins on the 5th degree of the harmonic minor scale. There are some common chord sequences that use notes from the phrygian dominant scale. I've always stressed the huge benefits of ear training, so you can recognise such chord sequences when they're played and know intuitively how to accompany them. As explained in the video, the most common chords used from the phrygian dominant scale are the 1 (I), 2 (II), 4 (iv) and 7 (vii) chords. The strongest indication a piece of music is in phrygian dominant is the movement from the tonic to the major II chord, one half step/semitone up. For example, in C major, that movement would be, in its most basic form: Cmaj > D♭maj, typically moving back and forth between the two. Also from the table, note the movement from the tonic down a whole step to the minor vii chord. In C major, that would be Cmaj > B♭m. Another strong indicator of phrygian dominant. While there are other chords (built on the remaining degrees of the scale), if you can learn to pick out movements between the above chords by ear, you'll know when phrygian dominant is the most likely scale of choice. Below I've picked out some backing tracks written specifically for phrygian dominant that use these chords. Jam along if you like! The most common example of this use of tension is in the minor key relationship between tonic (i) and dominant (V). For example, Am might be our tonic and therefore Emaj or E7 would be our "tension" chord. 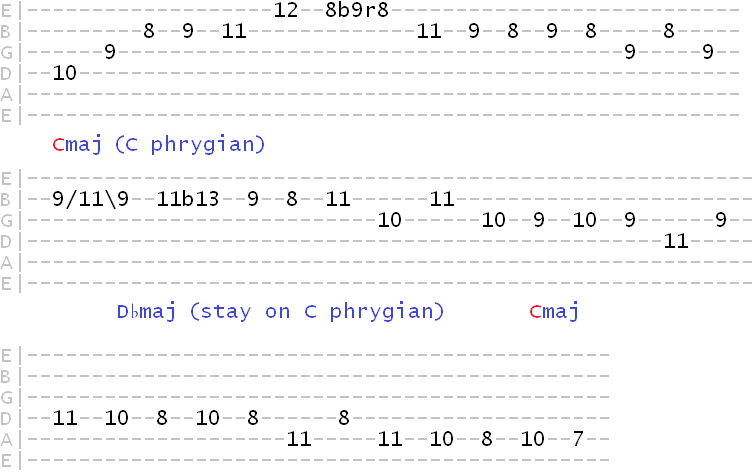 This is the chord over which phrygian dominant would work most naturally. As phyrgian dominant uses the same notes as harmonic minor, many musicians prefer to simply change from natural minor over the i tonic to harmonic minor (same root) over the V chord. This will give you the phrygian dominant colour over that V chord. This is because the 5th of harmonic minor becomes the root for that V chord, building on what we learned earlier. In major keys, the 3 (iii) chord is typically a minor chord. But often you'll hear it substituted with a major or dominant 7th chord. This creates a similar tension to the minor key V chord from earlier. Again, typically the 6 (vi) chord in major keys is a minor chord. But often it's replaced with a major or dominant 7th VI chord. This creates that familiar tension that, again, phrygian dominant would complement. Don't worry so much at this stage about creating technical solos using phrygian dominant. There'll be plenty of time to learn larger patterns and forms for navigating the scale fluidly. Focus on training your ear to the overall sound and mood phrygian dominant creates, both melodically (note sequences) and harmonically (chord sequences). Give it enough of your time, and eventually you'll be able to hear the "phrygian sound" when it occurs in music and feel it in the solos you write/improvise.